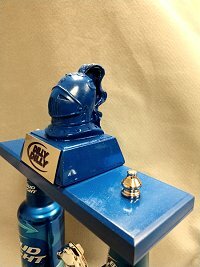 Be sure to also check out our Bud Knight Trophy. 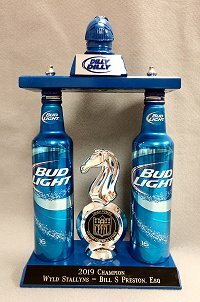 Our new Bud Light Knight trophy is inspired by these commercials, and features two empty bottles of Bud Light, along with a knight helmet on the top, and a chess knight figure holding a disc that acts as the award's title plate. All components of this unique award are blue and silver. The engraved plates are black brass (gold lettering).